Jax has Chronic Lung Disease (CLD), which is also called bronchopulmonary dysplasia or BPD. “CLD results from lung injury to newborns who must use a mechanical ventilator and extra oxygen for breathing.” Jax was on a ventilator for 34 days, SiPap and CPAP for 16 days, high-flow oxygen for 13 days, and low-flow oxygen for 71 days. (Jax came home on oxygen.) For being born at only 23 weeks, that’s pretty good! When Jax is around 2 or 3 years old, he will “out grow” the diagnosis of CLD. At that point, and if Jax is still having breathing trouble, the diagnosis would change to asthma or related diagnosis. My hope is that Jax’s lungs continue to get stronger so he grows out of the complications entirely! Mom said I was doing a good job breathing today. I’m not sure what that means, so I’ll just smile. She seems to like that. But sometimes, she gets all teary-eyed and says things like “oh, baby – I’m so glad you’re here!” Like, duh, mom – where else would I be? Last month, I got a brand new tooth. (I have 8 of them now!) I wasn’t a big fan – it hurt and it made my nose run. Although, I do like to stick out my tongue to see how much snot I can lick up. Mom told me to stop doing that. Whatevs, mom. I don’t know what the big deal is. After a few days with a runny nose, I started purring like a kitty. Mom said it’s called wheezing. (All that snot must have made it’s way down to my throat and lungs – mom said “I told you so!”) I started purring really loud especially when I practiced running and playing hide and seek. After a few minutes of playing, I could hardly breathe at all. I had to take a break and read some books. That was hard for me, because running is one of my favorite things to do! Mom always listens to the purring to see if it happens when I breathe in or when I breathe out. Sometimes, it happens when I breathe in and that means my airway is collapsing. This is because I have a problem called bronchomalacia. My mom says my “floppy airway” makes it hard for me to breathe, too. Sometimes, when I play, I cough so hard, my face turns purple. It’s hard for me to stop coughing and catch my breath. Mom always looks scared when this happens. She tells me to “just breathe, baby.” (I think I remember her saying that to me a lot when I was stuck in that plastic box with all the tubes and wires.) I get scared sometimes, too. My eyes get real big and I start to panic. I want to breathe! After 25 minutes, the medicine is finally gone. I’m so glad! I don’t like that medicine at all – it makes my mouth taste funny and it makes me all jittery and hyper. Mom always tries to get me to sit still so I can breathe better, but that medicine makes me want to jump on the couch and chase the balls. I can’t breathe when I run and the medicine that helps me breathe makes me want to run! Mom calls that a Catch 22. During the night, I wake up a lot because I can’t breathe. I start coughing really hard and it scares me, so I start screaming. Mom says it gives her a heart attack when I do this. I can’t help it, though. I’m real sleepy, but sometimes I just can’t catch my breath. Then mom has to wake up and give me more medicine. Sometimes, she lets me sleep on her chest so I’m not laying flat – that seems to help me breathe better. Mom says she’s sick of me waking up 3 or 4 times a night – she says she’s tired! So am I! It’s been a month since that new tooth popped out, and I still have to take that nasty medicine two or three times a day! Mom calls this the Yellow Zone. If I start needing my medicine more than three times a day and I’m purring really bad, that’s called the Red Zone. If that happens, then I have to go see all my friends at the hospital. They are nice there! But they stick me with all kinds of sharp things and put a fun, glowing light (called an oximeter) on my foot and expect me not to play with it. What are they thinking? I hope I stay in the Yellow Zone so I can stay at home and play with all my toys! I think I’m getting a little bit better – I’m not purring as much (and it’s only happening when I play real hard) and I’m only coughing a few times a day. Maybe I’ll be able to cut back on the medicine pretty soon! Mom says all these symptoms would be worse if I caught a cold or other sickness. That’s why I only get to play with my mom and dad (and sometimes Grandma) during the winter. Mom calls this isolation. I get sad when I see kids but can’t play with them. Hopefully my lungs are stronger next winter so I can play with friends my own age! I hope the next tooth I get doesn’t cause this much trouble! Thank you for sharing Jax’s thoughts….he is one amazing kiddo! Wow! Even with my own CLD prems this was an eye-opener. 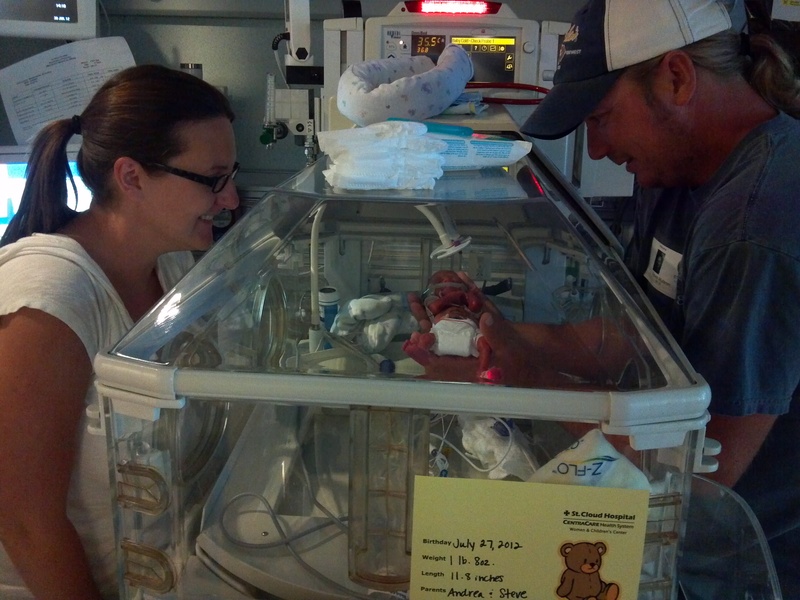 Reid had nebulized budesonide inhalations while he was in the NICU (he was on the jet ventilator for quite a while), but thankfully they weaned him off before he came home. Can’t imagine how tough it must be to keep your little guy still for that long (for something yucky, too!). Way to go, mama (and Jax). Hope it improves soon! Thanks for the comment! It is almost impossible to keep Jax still for the nebs. Thankfully he is easily distracted! 🙂 I’m so glad your little ones don’t have breathing issues anymore – hooray! Good to hear from Baby Jax……he is a hoot! to tell and write a story as well as you do. Wonderful way to let us know what’s going on. Hugs to you all. I always forget, what’s the difference between wheezing on the inhale vs. the exhale? I know our doc always asks that when Sander starts wheezing. It’s always hard for me to tell, too. To me, stridor, or wheezing on the inhale sounds kind of like a honk. (Listen: https://www.youtube.com/watch?v=EMKxnyPs7K8). Wheezing on the exhale sounds like a purr or like an old man! (Listen: https://www.youtube.com/watch?v=_PXph0CfxYU) How are Sander and Kadri doing? Great idea, Tricia! I hadn’t thought of that. I’d love a lesson – I have listened while at the doctor’s office, but could never really tell what they are talking about.